Awovi joined EEM in 2017 after completing a Master’s degree in Environmental Management, which allowed her to develop management skills and a greater understanding of sustainable development concepts and sustainable business practices. 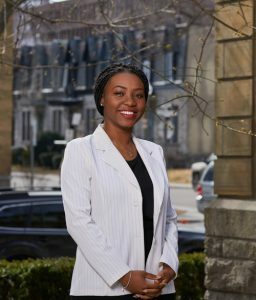 Prior to joining EEM, Awovi honed her legal skills and understanding of EHS regulatory compliance at a global agrifood company in Accra (Ghana), at a Montreal-based technology and legal information company, and at an international manufacturer of recreational vehicles. Analysis of legislative and regulatory changes in environment, health and safety (EHS). Development of EHS legal registers. EHS Governance and Climate Change Issues in the Mining Industry in sub-Saharan Africa. Sustainability analysis of the Plan Nord project of the Government of Quebec. Environmental and Social Impact Assessment of a landfill project in Saint-Nicéphore. EHS management system implementation and maintenance. EHS legal and regulatory compliance. Analysis of the impact of EHS policies and regulations. Challenges related to sustainable development and international environmental issues. Multi-criteria analysis of development projects. Mining governance and EHS challenges in Sub-Saharan Africa. Qualified as an ISO 14001 and ISO 45001 lead auditor. French, English, Spanish (limited skills), Ewe, Mina, Tem.